I have always found it interesting to follow certain technology companies on the stock markets, but now that Facebook is preparing for IPO this just got a whole lot more interesting. I also like to keep tab on our large Australian companies, not so tech related. Apple is the most valuable company in the world. Microsoft still one of the most valuable companies, which it has been over the past 30 years. BHP is worth more than Google. Next time you are running a Google search remember that. 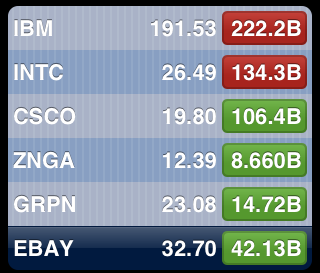 A ‘social gaming company’, Zynga is worth more than LinkedIn. It all comes down to user numbers? Zynga > 200million, LinkedIn @ 135 million. A lot of people criticize Yahoo, the company is still worth over $19 billion USD. We will soon see Facebook on the stock exchange with ticker code FB. What do you find interesting about these figures? This is the selective list of stocks I’m following, I realise there are many more – any others you think I should add? I am waiting to see what the Yelp IPO generates.